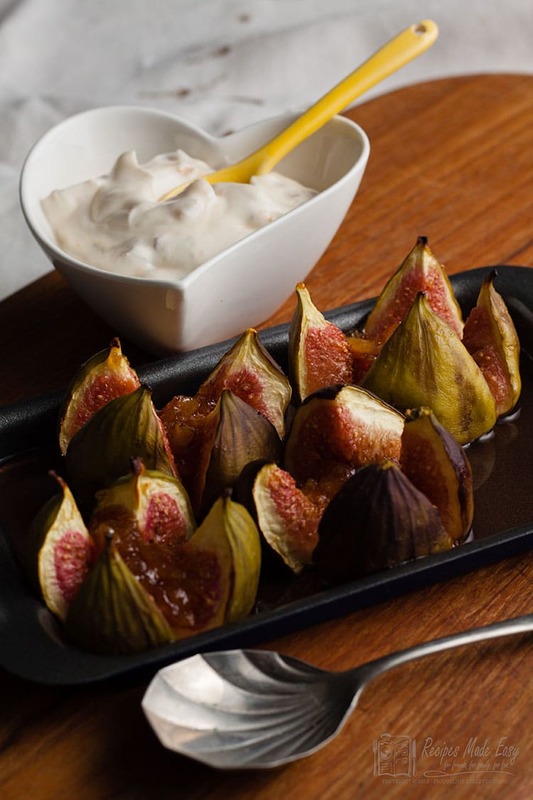 Roasted Figs filled with marmalade and topped with an orange and ginger flavoured cream – the perfect dessert to spoil someone special with. 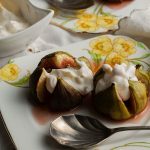 To me roasted figs with ginger cream is a really grown up and sophisticated dessert, yet so simple to make. 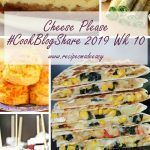 It takes less than 5 minutes to prepare and around 10-15 minutes to cook. So simple in fact a child could do it! Maybe it feels grown up to me because as a child, I really didn’t like figs and it is only since fairly recently that I have started to enjoy them. It is probably one of those foods that you grow to like. Now I particularly like them roasted as that seems to bring out their quite subtle but delicious flavour. The colour of figs is not a great indicator ripeness. Ripe figs feel plump, give slightly when squeezed, and have a mild sweet fragrance. How to Store Fresh Figs. Fresh figs are very perishable, so are best bought just a day or two before eating and stored in the fridge. 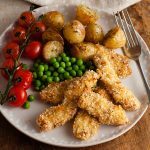 If you are eating them raw they will have a better flavour if you allow them to come to room temperature before you eat them. 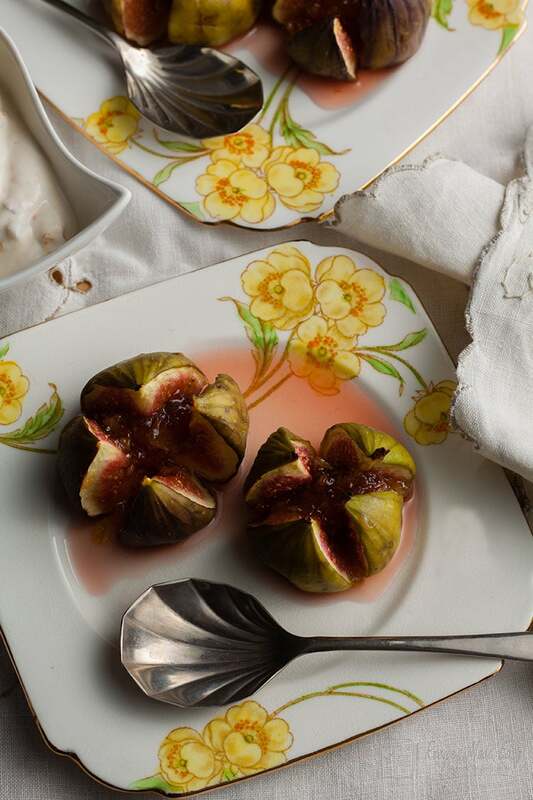 Store figs on a plate or in a container lined with a sheet of kitchen paper in a single layer to avoid crushing. They are delicate and need a little TLC. Figs are eaten whole, so all you need to do is give them a gentle wash and pat dry on kitchen paper. Cut off the stem (if any) at the beginning of the fruit, give them a gentle wash under running water and then dive in! Fresh figs are very versatile. 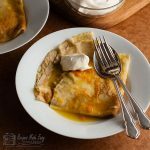 Not only delicious eaten on its own as a fruit but with yogurt for breakfast or in a variety of different dishes. Figs are low in fat and calories. 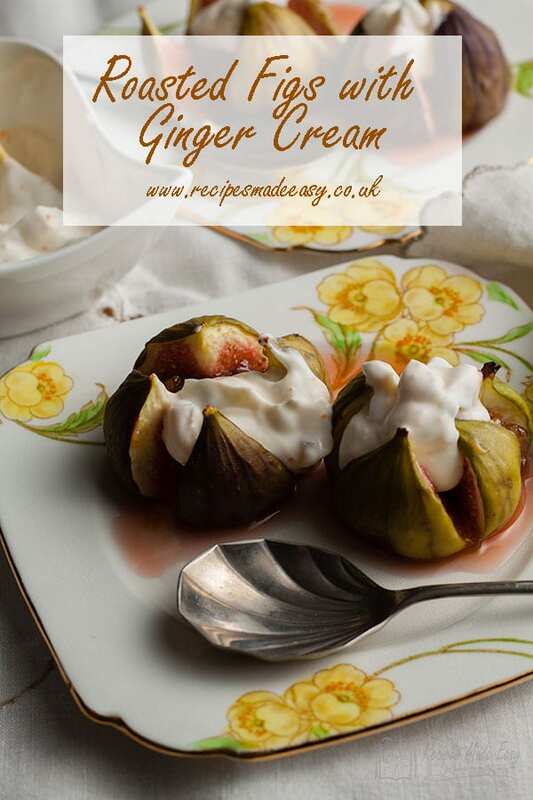 I have made this fig and ginger cream recipe using crème fraîche and it works just as well with the reduced fatcrème fraîche which will reduce the total calories further. Enjoy this dessert without any guilt! But figs are not just great for desserts. One of my current favourite starters is Figs with Goats Cheese Salad. Again, so simple and yet really flavourful. Pretty too. They can be a great addition to a side salad. When in season I often pop them on a cheese board, they go amazingly well with cheeses. I have also served them opened out, topped with goats curd and briefly roasted as a cheese course alongside a blue cheese served with fig jam for a special meal. I have yet to make fig jam, but it is only a matter of time. A delicious quick and easy dessert for two. Preheat the oven to 180℃ (160℃ fan)/350°F/gas mark 4. Cut a cross in the figs almost to the bottom and open out slightly. Place on a small baking tray. Spoon a teaspoon of marmalade into the centre of each fig. Roast in the oven for 10-15 minutes until figs are hot the marmalade starts to melt and caramelise. Meanwhile mix together the crème fraîche and chopped ginger. Transfer the figs to warm serving plates, spooning over any juices from the tray. Serve topped with the flavoured crème fraîche, or serve the crème fraîche in a small bowl alongside. 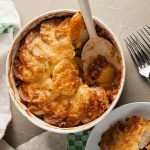 This recipe is easy to double up to serve more. Wash the figs then trim off the stem and cut a cross into each fig. Open out slightly and spoon in a little marmalade. 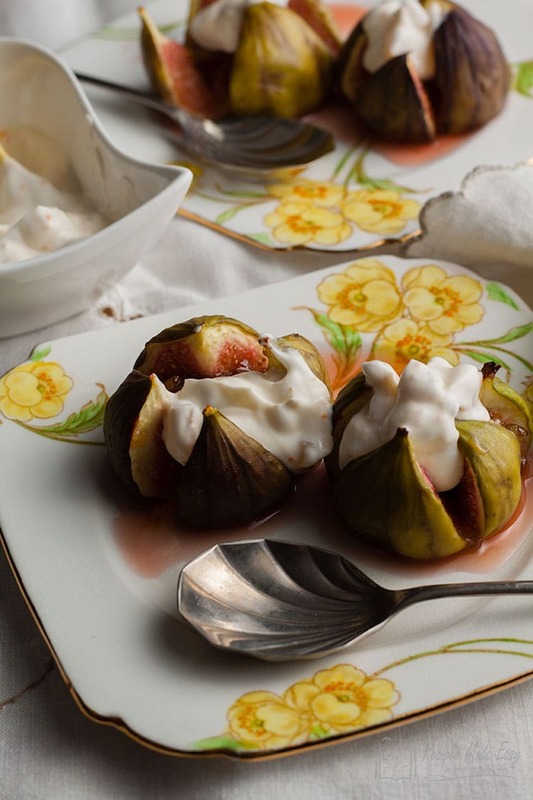 Serve the figs with the juices spooned over and the cream on the side. YUM! I love roasted figs! This would be easy to made safe for me & I’m not sure Id want to share them! I was home alone when I shot this post so I didn’t share them!! I adore figs, these will now always remind me of the time I spent at a Pilates retreat called Pignoulet in Gascony, France. 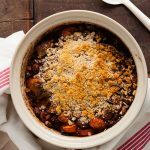 The fig tress were loaded with ripe fruits and we could have eaten them all day every day, this is a simple yet utterly satisfying way to eat them – deeelicious. I love figs but tend to just eat them as they are. 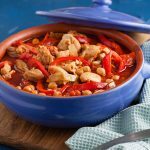 This recipe looks like a great way to jazz them up a bit! I like them as they are but they are so good roasted too. These look so tasty! 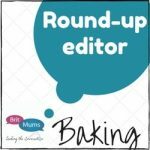 I think they’d make a lovely light Valentine’s dessert too, although I know my husband will probably want something with chocolate! Mr B doesn’t do Valentines but he would eat these any day if I let him. Yes, the ginger cream is rather good I guess you could use it with a lot of fruit. It would be lovely with rhubarb. This looks like the perfect dessert – really simple but a little bit different. I didn’t like fresh figs until recently either – I think it’s the texture for me. I absolutely love your plates too. They’re gorgeous! yes I would agree I think it was the texture for me too.